Volborthite: Mineral information, data and localities. Olive-green, yellow-green; green to yellow-green in transmitted light. Named after Alexander von Volborth (1800-1876), Russian paleontologist, who first noted the mineral. 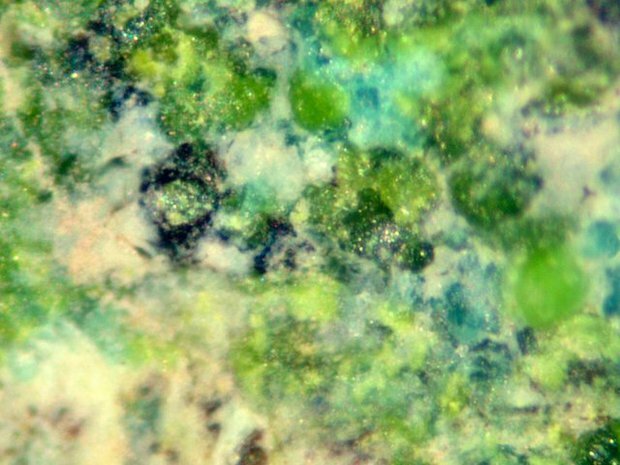 A secondary mineral found in the oxidized zones of vanadium-bearing hydrothermal deposits. At least two different monoclinic space-group variants (C2/m, C2/c) seem to be stable at ambient temperature. Pseudohexagonal. Scaly, fibrous or spongy crusts and rosette-like aggregates; also reticulated. Scales may have a triangular or hexagonal outline. Barian Volborthite A barium-bearing variety of volborthite. Tyuyamunite 20 photos of Volborthite associated with Tyuyamunite on mindat.org. Malachite 17 photos of Volborthite associated with Malachite on mindat.org. Chrysocolla 8 photos of Volborthite associated with Chrysocolla on mindat.org. Vashegyite 7 photos of Volborthite associated with Vashegyite on mindat.org. Brochantite 6 photos of Volborthite associated with Brochantite on mindat.org. Sulvanite 5 photos of Volborthite associated with Sulvanite on mindat.org. Cyanotrichite 5 photos of Volborthite associated with Cyanotrichite on mindat.org. Quartz 4 photos of Volborthite associated with Quartz on mindat.org. Ankinovichite 4 photos of Volborthite associated with Ankinovichite on mindat.org. Allophane 3 photos of Volborthite associated with Allophane on mindat.org. Hess (1838) Bull. Acad. St. Petersburg (1838), 4, 21-22. Hess (1838) Journal für praktische Chemie, Leipzig: 14: 52. Planer (1849) Archiv für wissenschaftliche Kunde: 8: 135 (as Knauffite). Genth (1877) Proceedings of the American Philosophical Society: 17: 122. Hillebrand and Merwin (1913) American Journal of Science: 35: 441 (on material called Calciovolborthite = Tangeite). Fersman (1925) Priroda, Leningrad, no. 7-9, col. 238 (as Uzbekite). Kurbatov (1926a) Centralblatt für Mineralogie, Geologie und Paleontologie, Stuttgart: 345 (as Uzbekite). Kurbatov and Kargin (1927) Comptes rendus de l’académie des sciences de l’U.R.S.S., n.s., no. 75-80 (as α-Uzbekite and β-Uzbekite). Mellor, J.W. (1929) A Comprehensive Treatise on Inorganic and Theoretical Chemistry. 16 volumes, London: 9: 767. Barth and Berman (1930) Chemie der Erde, Jena: 5: 30 (as Uzbekite). Fersman (1930) Abh. pr. Geol. Bergwirtsch. : 19: 36. Strunz, H. (1939) Mineralien der Descloizitgruppe. Konichalcit, Staszizit, Austinit, Duftit, Aräoxen, Volborthit, Pyrobelonit. Zeitschrift für Kristallographie, Mineralogie und Petrographie, Leipzig (A) 101, 496-506. Palache, C., Berman, H. and Frondel, C. (1951) The System of Mineralogy of James Dwight Dana and Edward Salisbury Dana, Yale University 1837-1892, Volume II. John Wiley and Sons, Inc., New York, 7th edition, revised and enlarged, 1124 pp. : 816, 818-819. Leonardsen, E.S. and Petersen, O.V. (1974) The unit cell of volborthite. American Mineralogist 59: 372-373. Basso, R., Palenzona, A., and Zefiro, L. (1988) Crystal structure refinement of volborthite from Scrava mine (Eastern Liguria, Italy). Neues Jahrbuch für Mineralogie, Monatshefte 1988, 385-394. Lafontaine, M.A., Le Bail, A., and F´erey, G. (1990) Copper-containing minerals – I. Cu3V2O7(OH)2, 2H2O: the synthetic homolog of volborthite; crystal structure determination from X-ray and neutron data; structural correlations. Journal of Solid State Chem., 85, 220–227. American Mineralogist (1991) 76: 671. Pekov, I.V. (1998) Minerals first discovered on the territory of the former Soviet Union, 231–232. Ocean Pictures, Moscow. Anthony, J.W., Bideaux, R.A, Bladh, K.W., and Nichols, M.C. (2000) Handbook of Mineralogy, volume IV: arsenates, phosphates, vanadates. Mineral Data Publishing, Tucson, Arizona. Green, D.I., Hubbard, N., and Ince, F. (2008) A review of the occurrences of the copper vanadate minerals volborthite and tangeite in the British Isles. Journal of the Russell Society, vol. 11, 54-58. Kashaev, A.A., Rozhdestvenskaya, I.V., Bannova, I.I., Sapozhnikov, A.N., and Glebova, O.D. (2008) Balance, uniformity, and asymmetry of the structure of volborthite Cu3(OH)2(V2O7).2H2O. Journal of Structural Chemistry 49, 708-711. Yoshida, H., Yamaura, J., Isobe, M., Nilsen, G.J., and Hiroi, Z. (2012) Orbital switching in a frustrated magnet. Nature Communications 3, 8601-8605. The following Volborthite specimens are currently listed for sale on minfind.com. Friz, C. T., Rodrigo, F. y Stipanicic, P. N. Recursos y posibilidades uraníferas en Argentina. Comisión Nacional de Enrgía Atómica. Session 2.11, pp. 42 - 54. Buenos Aires, Argentina. PONS, Josefina M. et al. Alteration, Cu mineralization and bitumen in the Barda González prospect, Neuquén. Rev. Asoc. Geol. Argent. [online]. 2009, vol.64, n.3, pp. 501-513. Noble R.J., Just J. and Johnson J. E., 1983, Catalogue of South Australian Minerals-1983, Government Printer, Adelaide. ; Brown, H.Y.L., (1908), Record of The Mines of South Australia , 4th ed., Government Printer, Adelaide. Brandstätter, F., Kolitsch, U., Niedermayr, G., Prasnik, H., Seemann, R. & Walter, F. (2011): 1677) Baryt, Bornit, Brochantit, Chalkopyrit, Chalkosin, Chrysokoll, Galenit, Palygorskit, Pyrobitumen, Tetraedrit und Volborthit aus dem Steinbruch „Jakomini“, nördlich Nötsch. Pp. 142-145 in Niedermayr, G. et al. (2011): Neue Mineralfunde aus Österreich LX. Carinthia II, 201./121., 135-186. INGELSON, A. (1984) Mineral occurrences in Western Canada. Mineralogical Record 15, 89-94. ; Jambor, J. L. (1960). Vanadium-bearing interlava sediment from the Campbell River area, British Columbia (Master thesis, University of British Columbia). [MinRec 15:89]; Jambor, J. L. (1960). Vanadium-bearing interlava sediment from the Campbell River area, British Columbia (Master thesis, University of British Columbia). Sullivan, B. (1978) Letter from Europe. Mineralogical Record. 9:2, 132-134, (at p.134). Johan, Z, Povondra, P.: Vanadium- and copper-bearing dolomite nodules from Permian sediments near Horní kalná, Czechoslovakia. Neues Jahrbuch für Mineralogie – Abhandlungen, 1987, Vol. 157, Number 3, s. 245-266. Markl, G. (2017). Schwarzwald. Lagerstätten und Mineralien aus 4 Jahrhunderten. Bd.4: Südlicher Schwarzwald. Das untere und das kleine Wiesental. Ed. Krüger-Stiftung. Bode Verlag, 31020 Salzhemmendorf, 880 pp. [p. 608]. Hohn, G., Leu, K. (2015): Mineralien vom Goßberg bei Walsdorf, Eifel.- Lapis, 40 (Nr. 11), S. 30-36 + 54. [MinRec 32:356]; ; Basso, R., A. Palenzona, L. Zefiro (1988) Crystal structure refinement of volborthite from Scrava mine (Eastern Liguria, Italy). Neues Jahrbuch für Mineralogie, Monatshefte 1988, 385-394, Bruno Marello collection; Marchesini M. (1999): Tronchi silicizzati: associazioni a rame, arsenico e vanadio. Riv. Mineral. Ital., 23, 2 (2/1999), 116-122. Antofilli, M., Borgo, E., Palenzona, A. (1985) I nostri minerali. Geologia e mineralogia in Liguria. II Edizione. SAGEP Editrice, Genova, 296 pp. [MinRec 18:287]; Bombarda, L., Granai, F., and Orlandi, P. (1999) Le cave di Val Bona e Val Pulita. Rivista Mineralogica Italiana, 23, 2 (2-1999), 100-102. Matsubara, S., Saito, Y., Kato, A. (1990) Vanadium minerals in siliceous sedimentary rocks from Unuma, Gifu Prefecture, Japan, with special reference to volborthite and roscoelite. Ganseki-Koubutsu-Koshogaku Zasshi, 85, 522-530. 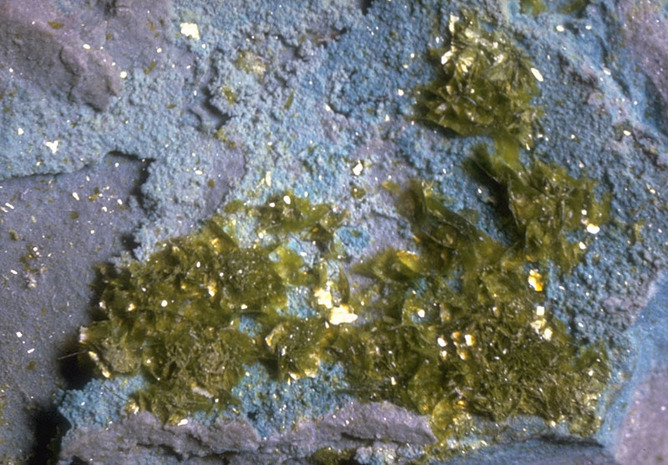 PXRD by John Attard, May 2014, on samples collected by Alfredo Petrov. Schneider G. 1894: Die Minerale des Riesen- und Isergebirges. Wanderer im Riesengeb. Bd 6. Palache, C., Berman, H., & Frondel, C. (1951), The System of Mineralogy of James Dwight Dana and Edward Salisbury Dana, Yale University 1837-1892, Volume II: 819. Novák, F. et al. (2003): Koninckit, evansit, vashegyit a volborthit z Kocihy u Rimavské Soboty. Bulletin mineralogicko-petrografického oddělení Národního muzea v Praze, roč. 11, s. 159-166.
from XRD and EPMA results - B. Smith. ; Green, D.I., Hubbard, N., and Ince, F. (2008) A review of the occurrences of the copper vanadate minerals volborthite and tangeite in the British Isles. Journal of the Russell Society, vol. 11, 54-58. Hubbard, Burchard, Green (2005) A remarkable supergene mineral suite from New Cliffe Hill Quarry, Stanton Under Bardon, Leicestershire. UK Journal of Mines & Minerals 26, 31-42.; Hubbard, N., Burchmore, S., and Green, D.I. (2005) A remarkable supergene suite from New Cliffe Hill Quarry, Stanton under Bardon, Leicestershire. UK Journal of Mines & Minerals, 26, 42-51.; Green, D.I., Hubbard, N., and Ince, F. (2008) A review of the occurrences of the copper vanadate minerals volborthite and tangeite in the British Isles. Journal of the Russell Society, vol. 11, 54-58. King, R.J. and Dixon, J.A. (1971) A New Occurrence of Vanadium Minerals in Leicestershire. Mineralogical Magazine, vol. 38, n° 296, 488-492.; Embrey, P.G. (1978) Fourth Supplementary List of British Minerals. Mineralogical Magazine, vol. 42, n° 322, 169-177. Green, D.I., Hubbard, N., and Ince, F. (2008) A review of the occurrences of the copper vanadate minerals volborthite and tangeite in the British Isles. Journal of the Russell Society, vol. 11, 54-58. King, R.J. and Dixon, J.A. (1971) A New Occurrence of Vanadium Minerals in Leicestershire. Mineralogical Magazine, vol. 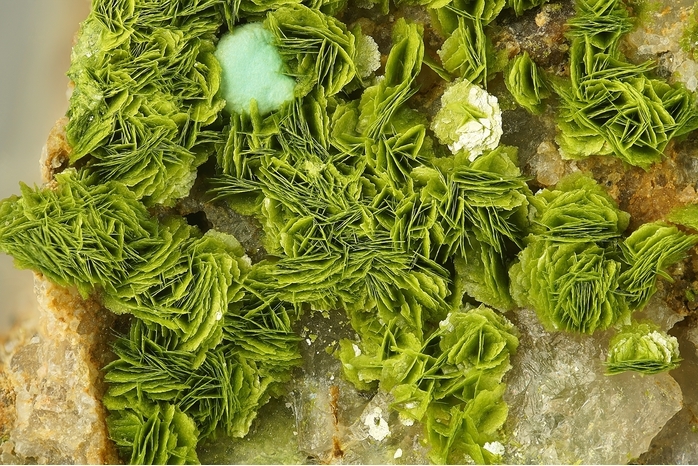 38, n° 296, 488-492.; Green, D.I., Hubbard, N., and Ince, F. (2008) A review of the occurrences of the copper vanadate minerals volborthite and tangeite in the British Isles. Journal of the Russell Society, vol. 11, 54-58. Specimen L1436 in the Leicester University collection. ; Ince, F. (2007) The mineralogy of Bardon Hill Quarry, Coalville, Leicestershire. Journal of the Russell Society, vol. 10, 27-39.; Green, D.I., Hubbard, N., and Ince, F. (2008) A review of the occurrences of the copper vanadate minerals volborthite and tangeite in the British Isles. Journal of the Russell Society, vol. 11, 54-58. Anthony, J.W., et al (1995), Mineralogy of Arizona, 3rd.ed. : 415. Testing at University of Arizona. Most specimens labelled Tangeite are actually Volborthite. Anthony, J.W., et al (1995), Mineralogy of Arizona, 3rd.ed. : 415; Witkind, Irving J. & Thaden (1963), USGS Bull. 1103, Geology & Uranium-Vanadium Deposits of the Monument Valley Area Apache and Navajo Counties, Arizona: 68, 135. Anthony, J.W., et al (1995), Mineralogy of Arizona, 3rd.ed. : 405; Witkind, I.J. (1961), The uranium-vanadium ore deposit at the Monument No. 1-Mitten No. 2 mine, Monument Valley, Navajo Co., AZ, USGS Bull. 1107-C: 219-242; Holland, H.D., et al (1958), The use of leachable uranium in geochemical prospecting on the Colorado Plateau-II, The distribution of leachable uranium in surface samples in the vicinity of ore bodies, Econ.Geol. : 53: 190-209. Minerals of Colorado (1997) E.B. Eckel; Shawe, D.R., (2011), Uranium-vanadium deposits of the Slick Rock district, Colorado: U.S. Geological Survey Professional Paper 576-F, 80 p., 20 plates. SEM EDAX verified by Excalibur minerals. Collected by and in the collection of Brent Thorne.